High quality Matcha (40g) in cylindrical tea caddy. Matcha, which is occasionally spelled ‘Maccha’, is a finely ground green tea synonymous with the Japanese Tea Ceremony known as ‘Chado’. As the most potent of green teas (at around fifteen times the strength of its counterparts), it was originally reserved for Japanese royalty and religious dignitaries. However, thanks to its fantastic antioxidant properties, it is becoming increasingly popular amongst health conscious Western tea drinkers. The health benefits include energy booster, calorie burner and detoxes the body. Unlike most teas, this simultaneously sweet and astringent tea is best enjoyed by drinking with long sips. Its high dose of antioxidants, vitamins and minerals have been proven to significantly increase energy whilst avoiding the ‘crash’ associated with more caffeinated beverages, making it both a perfect start to the day or an antidote to post-lunch lethargy. Matcha, which is occasionally spelled ‘Maccha’, is a finely ground green tea synonymous with the Japanese Tea Ceremony known as ‘Chado’. As the most potent of green teas (at around fifteen times the strength of its counterparts), it was originally reserved for Japanese royalty and religious dignitaries. However, thanks to its fantastic antioxidant properties, it is becoming increasingly popular amongst health conscious Western tea drinkers. Unlike most teas, this simultaneously sweet and astringent tea is best enjoyed by drinking with long sips. Its high dose of antioxidants, vitamins and minerals have been proven to significantly increase energy whilst avoiding the ‘crash’ associated with more caffeinated beverages, making it both a perfect start to the day or an antidote to post lunch lethargy. The smooth, velvety taste of Matcha is attained through specific harvesting techniques which ensure the leaves are shaded for several weeks before they are picked. This refined process not only allows the buildup of antioxidants, it also lends the tea the naturally sweet flavour that makes it so popular here at the Kettle Shed. The taste is also greatly influenced by the quality of the tea. Higher grade Matcha is naturally sweeter and more full-bodied, requiring very little to enhance its taste, although some people have been known to forego tradition and add honey or sugar to the brew. In fact, tea lovers Stateside, where 70 percent of all tea is iced, add syrup, ice and milk to blend the tea into a frozen Matcha Latte! Many Westerners like to think of Matcha tea as a ‘new fad’ but, in reality, it has been drunk for nearly a thousand years since Zen Buddhas brought it to Japan from China to help them stay focused whilst meditating. Though unproven, it has long been believed that the Zen Monk, Eisai, brought the first green tea seeds to Japan in 1191. At the same time, Eisai introduced Zen philosophies to the Japanese and so Matcha and Zen became intertwined in the exquisitely refined tea ceremony known as The Way of Tea which follows traditional rituals in both the preparation and consumption of the tea. In Japan there are two forms of Matcha – one that is used for everyday tea and another that is reserved for ceremonial occasions. Both forms come from the Camelia Sinensis plant and follow a similar harvesting process whereby the plants are shaded with a canvas or bamboo mesh covering for three weeks prior to the leaves being picked. This shading increases the production of chlorophyll which gives the tea its bright green colour and, in turn, increases the level of L-Theanine, an amino acid that gives the tea its sweet taste. The tender Gyokuro leaves are then steamed and laid flat to dry, becoming a crumbly leaf known as tencha which is de-stemmed and de-veined before being stone ground into the fine silky powder that is Matcha. Although China is the main exporter of teas in general, Matcha is only produced in Japan where domestic demand is so high that less than one percent is exported. 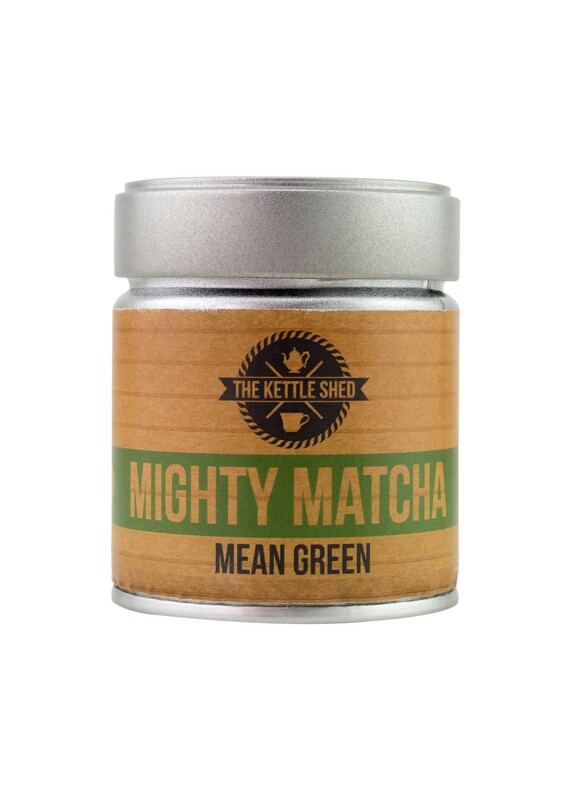 The finest grade Matcha, which we prefer here at the Kettle Shed, uses only the youngest leaves from the top of the plants, all of which are handpicked and stone ground. True Matcha tea only comes from tencha. Because the whole leaf is used and ground to a powder, Matcha is about 15 times stronger than any other green tea so you should allow 1 – 2 teaspoons per serving. The best way to make Matcha is using a bamboo whisk. However, if you don’t own one then follow the alternative instructions. Firstly, boil water and allow to cool slightly. This is because boiling water deactivates the feel-good amino acids, specifically the L-Theanine. Scoop required amount of tea powder into a wide brimmed mug. Add a small amount of hot water and whisk up and down rather than in a circular motion. Ensure all the powder blends into a smooth paste. Add the remaining hot water to the paste and continue to stir with the bamboo whisk until the liquid is smooth and slightly frothy. Scoop required amount of powder into a mug. Add a small amount of hot water and, using the back of a spoon, mix to a smooth paste. Continue to stir while slowly adding the remaining hot water. The tea should be smooth but will not be frothy. The tea should be smooth but may not be frothy.